Story: In school Tae-soo (Jo In-Seong) rules with his fists and earns the respect of his classmates. His father is a crook and thief and when he one day sees him pleading in front of a prosecutor he realizes who really wields power in this world. From that day on he learns for school and doesn't just make it into university, but even graduates. As a prosecutor he soon sees the corruption which is all around him in this profession. 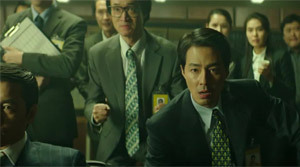 He fights it, but eventually gets to know Dong-cheol (Bae Seong-woo), who pleads him to let a certain case be. Tae-soo doesn't want to sell his soul, though. 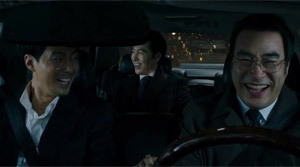 However, when he meets Han Kang-sik (Jung Woo-sung) at one of his luxurious parties, he realizes that he counts among the very few politically influential individuals in the country and moreover Tae-soo could make a lot of money under Han. Han is significantly involved in political power struggles and has enough material in his file archives to mute unwanted rivals of certain politicians. He also has strong ties to the underworld and thus Tae-soo meets gangster Doo-il (Ryu Jun-yeol) from his home village, who he eventually becomes friends with. But Tae-soo is an expandable cog in Han Kang-sik's staff and soon finds himself on the loser's side. Still, giving up is not part of his nature. 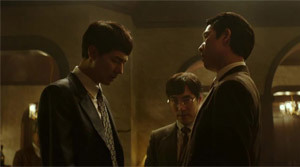 Review: The stage for a movie like "The King" is of course perfectly set in Korea at the moment. After the scandal around president Park Geun-hye the sense of justice in Korean people has maybe never been stronger and accordingly director Han Jae-rim has an easy time cutting into a wound that is already open. Consequently, "The King" was also successful at the box office. The political drama revolves around corruption, the leading elite of the country, the manipulation of the media and also making amends. The story's hero is after all a part of the corrupt machinery, but is as much exploited as all those who serve as a tool or pawn in a bigger chess game. The story gets the epic scale it deserves and especially shines with interestingly written characters. First off, you might be surprised to see Jo In-Seong again after his last movie role nine years ago in "A Frozen Flower". Initially, I considered him everything but likeable, but since his role in "A Dirty Carnival" I changed my mind. In "The King" he proves that he has added a lot to his acting repertoire and turns out to be an outstanding actor who manages to carry the movie on his shoulders fantastically and who hopefully will be seen more in future movies instead of just drama shows. Tae-soo's constant change as an individual, after all the story encompasses nearly 20 years, is captured very convincingly and yet he remains the same person in his core. Still, the interesting question is rather if Tae-soo is supposed to be someone we should relate to. In a certain way he is, of course, but that's not what the plot aims for. 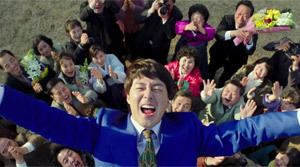 Tae-soo succumbs to the notion that money and power is everything, but he also shows that it doesn't have to be too late to walk on the path of righteousness again. In other words, he stands as a hero who consists of shades of grey and naturally that's also what makes him so fascinating. 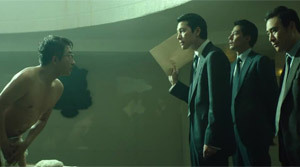 Taking the role as the villain is Jung Woo-sung ("The Divine Move"), who actually has a few nice scenes, but is often enough outshined by Jo In-Seong. Next to that there is Bae Seong-woo ("Remember You") having a bigger supporting role. The political drama shines with some additional supporting characters which enrich the story. A couple of them would have needed more space, though, particularly the female prosecutor who sporadically rains on the villains' parade. Director Han Jae-rim ("The Face Reader", "The Show Must Go On") has put together a very ambitious movie and doesn't fail. The pictures are slick, the editing inventive, the soundtrack well chosen and yet style doesn't stand over substance. First and foremost, the story takes center stage. And the plot is well achieved and multilayered. We move from the world of rich lawyers and politicians into the underworld and we realize that parallels are all too obvious. There is betrayal, revenge, plans being made and friendships that are about to fall apart. In the end, the question naturally pops up for Tae-soo if this is worth all the trouble, only to be able to go on parties with a lot of champagne and beautiful women. After all, the film also wants to appeal to our conscience. This happens on a subtle level and benefits from the story spanning twenty years and actual political changes being integrated into the story. Four presidents - brought to screen via stock footage - show the political change within the country and yet make you realize that certain things never change after all. Corruption and lust for power are like a growing tumor in the country and not just in Korea, which is why we are soon captured by the story and don't necessarily need historical background knowledge in order to grasp the small political nuances. Apart from that "The King" most importantly convinces with its colorfully written characters, who also grow with the decades passing by. Accordingly, the movie works great as a political drama as well as a character drama.